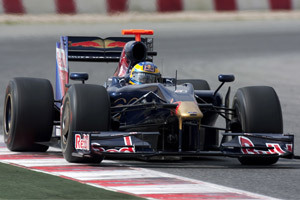 For a third consecutive year, Scuderia Toro Rosso’s motive power comes from a Ferrari V8, basically the same as in 2008, as a result of the engine freeze. With new rules concerning how many engines can be used, a reduction in the maximum rev limit and the need to cope with the arrival of KERS, the engine engineers still had plenty to think about while preparing for the 2009 season. Gilles Simon, Ferrari’s Head of Engine and Electronics explains the implications: "The work of the FIA and FOTA led to several measures aimed at reducing costs in F1 and on the engine front, each driver is now allowed eight engines per season, while the maximum rev limit has been reduced. The average life of an engine therefore goes from around 1,200 to 2,500 kilometres, but how the engines are managed over the course of a race weekend is entirely down to the teams themselves." The STR4 is also fitted with a KERS system provided by Ferrari and developed in conjunction with Magnetti-Marelli. Running and maintaining it is up to Toro Rosso, although, one additional Ferrari engineer will work on KERS within the Toro Rosso team at the race tracks. At the launch on 8 March at Circuit de Catalunya, technical director Giorgio Ascannelli added that their STR4 is completely different from the RB5, Red Bull's 2009 car that was the basis for the STR4. No one of the team tells it in as many words, but the cars are strikingly similar because both Red Bull sponsored teams source from 'Red Bull Engineering', their common technical team based in Milton Keynes. The Italian team at Faenza did however design the engine fittings, KERS locations etc as those are all very different from the Red Bull RB5 which is powered by a Renault engine. Franz Tost meanwhile underlined the team's ambitions.